American Soldier is a concept album based on interviews with American enlistees and war veterans from various wars, from WWII to Iraq, and is meant as a social rather than a political statement about the disruptive influence that various aspects of war have on those who have spent months away from home, killed enemies, seen friends die, been wounded and returned as different human beings. The lyrics were written from the perspective of the interviewees, some of whose voices (including Geoff Tate’s own father who served in Korea) have been incorporated into the tracks on the album as vignettes, intros and the like. Musically, American Soldier is a welcome return to a heavier and more melodic style of rock with interesting guitar and vocal harmonies, solos with more bite than we’ve heard in ages and the trademark singing of Tate that ranges from a velvety softness to powerful outbursts in the higher registers. Just listen to the fourth track ‘At 30,000 FT’ where he displays his entire vocal range on a track that is genuinely Queensrÿche. On the whole, the entire album – no doubt because of the serious subject matter – conveys a dark and somber atmosphere which is emphasized by effective yet sparing use of sound effects such as air raid sirens and helicopters and some quite ingeniously incorporated oriental sounding parts. The album is very homogenous and the songs of a uniformly high standard – especially ‘A Dead Man’s Words’ (with its haunting saxophone outro reminiscent of ‘Promised Land’), ‘The Killer’ and ‘The Voice’ make me believe that this band still has something to offer. It’s been 12 years since founding member Chris de Garmo left the band during the Hear In The Now Frontier tour, and for many years this seemed to have been the end of Queensrÿche as we knew it when they were amongst the foremost progressive/melodic rock acts of their time. 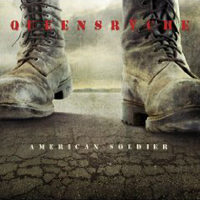 With Operation: Mindcrime II the band definitely took a step in the right direction, and American Soldier is one more army issue boot stomp on the road to full restoration. Sure, Geoff Tate may not be quite the same singer as he were in 1988, and there may still be a few post-grunge remnants that need to be weeded out such as on the first single ‘If I Were King’, but all in all I am still one pleased Queensrÿche fan.